Kolkata: Bengal is today both Rising and also Smiling. 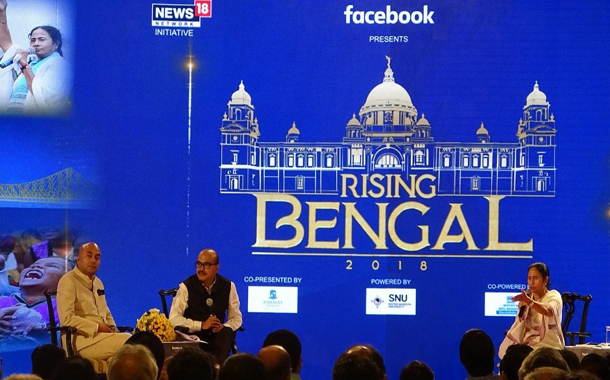 So said Chief Minister Mamata Banerjee at News18 Network’s Rising Bengal event in Kolkata. Banerjee, who was the chief guest at the event attended by the who’s who of West Bengal minced no words while speaking about the national and state political scene. Over the course of a two hour interaction, she said regional parties will play an important role in 2019. Taking questions on subjects as varied as politics to literature to even about herself, the CM said regional parties were growing stronger day by day. With confidence, CM Mamata said that 2019 will be people’s referendum and people will vote against the BJP and will vote for the opposition parties. Speaking about development in Bengal, she said that earlier Bengal was lagging behind. However, her government had repaid the debt of the previous government and due to its hard work, Bengal today is the number one in Skill development and in creating small industries. During the course of a lively and engaging discussion, the CM, noticing legendary magician and illusionist PC Sorcar in the audience, asked him to vanish the BJP government at centre before 2019. It was not all politics at Rising Bengal. The audience also got the chance to relax and be enthralled by a violin duet in between heated and healthy discussions. Asian Games medalists Swapna Barman, ShibnathDey Sarkar and Pranab Kumar Bardhan were felicitated by Chief Minister Mamata Banerjee. Many dignitaries like actress IndraniHaldar, Paoli Dam, Nusrat Jahan, Tanusree Chakraborty, director and producer ArindamSil, director Kaushik Ganguly, actor Ambarish Bhattacharya, Dev Adhikary, Vikram Chatterjee, Parambrata Chatterjee, singer and music director Anupam Roy, fashion designer Abhishek Dutta, Agnimitra Paul, artist Jogen Chowdhury, Grandmaster DibyenduBarua, cricketer Manoj Tiwary, Cricket Association Of Bengal’s former joint secretary BiswarupDey, Costarican World Cupper Johny Acosta, Magician PC Sorcar Junior attended the programme. News18 Network Managing Director Rahul Joshi welcomed the CM. Earlier, CPIM leader Sujan Chakraborty, TMC leader ChandrimaBhattachrya, BJP leader Shamik Bhattacharya, and Congress leader Shubhankar Sarkar took part in a discussion on whether Regional parties will be a decisive factor in National Politics in 2019. During that discussion, Congress leader Subhankar urged regional parties to understand the bigger national picture. Regional parties, he said, play an important in India’s politics, but they are busy with their own demands. He asked whether any leader from any regional party had resigned to protest demonetisation. BJP leader Shamik Bhattacharya said that he doesn’t underestimate the importance of regional parties. But regional parties need to give up their own demands, or else the country won’t be able to function properly. People want a steady government in centre, he said, adding that opposition parties were busy fighting amongst themselves. CPIM leader SujanChakraboty said that there are different languages, different castes in India and Regional parties can’t be ignored. He said the NDA was a coalition government only for namesake and just one party was running the centre. “RISING BENGAL” of News18 Network was held at Kolkata on 14th September, 2018, Friday. RISING BENGAL is part of initiative of News18 Network to act as a platform for Governments, Politicians and Persons involved in Social and Economic Development activities of the state with the people of the concerned state.